Pioneering Minneapolis Landscape Architects: Wyman, Morell and Nichols, but not Wirth? I’ve been surprised at the interest generated by posts here about landscape architects who worked on Minneapolis parks, so I’ll add the latest info I have on a few landscape architects. I once compiled a list of all the park designs and plans published in the annual reports of the Minneapolis Board of Park Commissioners for the first 60 years of its existence, 1883-1943. For the most part, that means the plans of Horace W. S. Cleveland, who designed the first Minneapolis parks, and Theodore Wirth, who was superintendent of parks 1906-1935. From the time Cleveland stopped working, about 1893, until Wirth was hired in 1906, the Minneapolis park board did not have a landscape architect — nor the money to pay one following a severe economic downturn — except for hiring Warren H. Manning for various projects from 1899 to 1905. No Manning plans for Minneapolis parks have survived, although his in-depth written recommendations for Minneapolis parks were published in the 1899 Annual Report of the Minneapolis park board. More on Manning in a later post. While Wirth was superintendent, he prepared nearly all park plans himself, although I believe he identified himself more as a gardener and engineer than a landscape architect. He listed himself as “Sup’t.” on most of his park plans until 1926 when he added “Eng’r.” He was an early and active member of the American Institute of Park Executives, but did not, to my knowledge, join the American Society of Landscape Architects. Wirth was not included in Pioneers of American Landscape Design, a compilation by Charles Birnbaum and Robin Karson of Americans who influenced the nation’s landscape. I think that is an oversight. While Wirth gets too much credit from some in Minneapolis for creating the city’s park system, his omission from a list of more than 160 prominent landscape designers in the United States probably gives him too little credit for shaping one of the nation’s premier urban park systems. Wirth’s omission from the “pioneers” list is more striking because three landscape architects who practiced in Minneapolis while Wirth was parks chief were profiled as pioneers: Anthony Urbanski Morell, Arthur Richardson Nichols and Phelps Wyman. I don’t believe it could be argued that any of the three had nearly as great an impact on the landscape of Minneapolis — and perhaps urban parks in general — as Wirth did, although they all worked in other locations as well. I have already written about Wyman, but would like to add notes on Morell and Nichols’s involvement with Minneapolis parks and update info on Wyman. The proposed arrangement of lawns, plantings and walks, is very pleasing and appropriate to the surroundings and the present topography of the grounds, and the execution of the plan will not involve a very large expenditure. Improvements to the park were begun in 1911 and completed in 1912. The Bell company originally paid for the work, but was reimbursed by the park board. The other references to Morell and Nichols in park board annual reports were in the 1930 and 1935 reports in connection with their work for Hennepin County, which includes Minneapolis, when they prepared a preliminary study for a county-wide park system in 1922 . Theodore Wirth referred to their plan in the 1930 annual report in his yearly words of encouragement for the Minneapolis park board to lead the effort to create a regional park authority. Wirth advocated including Minnehaha Creek, Bassett’s Creek and Shingle Creek, from their sources in Hennepin County lakes to the Mississippi River in Minneapolis, in a regional park system. In the 1930 report, Wirth included a map of the territory embracing the sources of Shingle Creek and Bassett’s Creek and highlighted park areas recommended by Morell and Nichols in their earlier report. Among the areas they had suggested for parks in northwest Hennepin County were portions of the shores of Medicine Lake, Bass Lake, Eagle Lake, Lime Lake, and all of Sweeney Lake adjacent to Glenwood Park. The map legend indicated that Robbinsdale planned to preserve the entire shorelines of Twin Lakes and Crystal Lake as parkland as well. Too bad that didn’t happen. Five years later, in the 1935 annual report, Wirth’s last as park superintendent, he published his own “Tentative Study Plan” for a park district for the west metropolitan region. Wirth had been directed by the park board in February 1935 to undertake the study in hopes that the board could apply for federal work relief funds to begin to implement a metropolitan park plan. Although funds were not forthcoming for that project, the idea of a county park system eventually led to the creation of what is today the Three Rivers Park District. Wirth submitted his report to the board in November 1935 and it was published in its entirety in that year’s annual report. 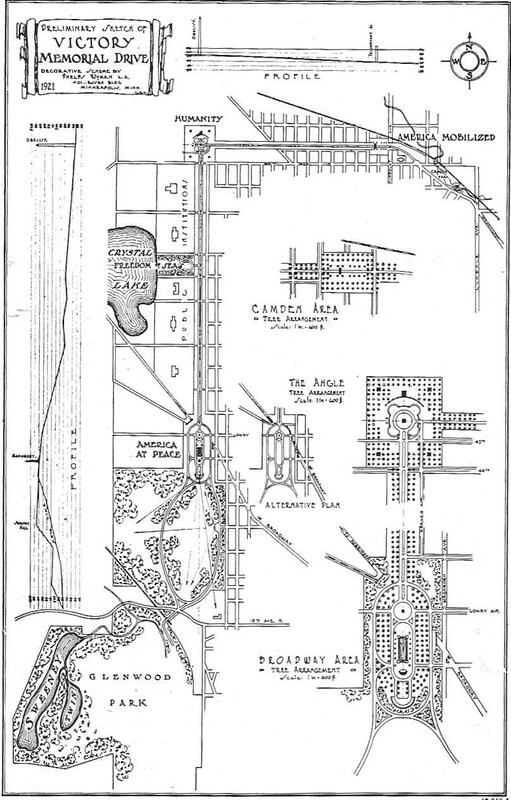 Wirth noted that his plan had been created in collaboration with Arthur Nichols, who was then the consulting landscape architect to the Minnesota Highway Department. Wirth wrote that he and Nichols had spent one afternoon a week for two months touring possible park and parkway sites in suburban and rural Hennepin County and had completed their research with aerial reconnaissance of prospective parks. These two events in which Morell and Nichols worked with Wirth on park design don’t tell us much about their practice, except that they seemed to have an effective working relationship with Wirth and were well-known to him and other decision makers, from developers to county commissioners. Phelps Wyman also knew Morell and Nichols. Morell was a consultant to the Minneapolis Planning Commission on which Wyman sat as the representative of the park board in the early 1920s. Wyman and Nichols had worked together for the US Housing Corporation in Washington, D.C. during the Great War. Moreover Nichols had been the first graduate in 1902 of MIT’s landscape architecture program, which Wyman completed a few years later. Having attended the same educational institution at a time when few academic programs in landscape architecture existed would have likely created some bond between them. In the 1929 annual report Wirth included Wyman’s “Preliminary Sketch of Victory Memorial Drive” from 1921 to illustrate the need for grade separations between parkways and city streets in some locations. In Wyman’s sketch, Broadway Avenue West tunneled under a large plaza at the intersection of Victory Memorial Drive and Lowry Avenue North. Wirth provided no explanation of why Wyman created his “decorative scheme” for the parkway, but it is a fascinating design. Another plaza, “Freedom of Seas”, would have connected Victory Memorial Drive to Crystal Lake between 39th and 40th avenues north. The only connection I can imagine between a stretch of land along a Robbinsdale lake and a “Freedom of Seas” park is the sinking of the Lusitania, an important factor in the U.S. entry into WWI and the resulting dead young men and women who were honored along Victory Memorial Drive. The “Drive” and the the “Flagpole” have been icons in Camden and the entire north side, since the crosses were erected on the parkway in the 20’s. During any afternoon summer and fall all the way from Golden Valley Rd. to the flagpole on 44th there would be kids playing softball or touch football. The stately elms were laid out in a pattern to provide a nifty ball diamond or football field. The rules would vary depending on the number of players per team. We needed at least 3 per side. That way we had a pitcher, shortstop, and left-fielder. The batting team supplied the catcher. To hit safely a batter had to hit the ball to the left of second base and reach first before the ball returned to the pitcher’s hand. The converse would obtain for left handed hitters. If we had four per side the whole field was far game. A ball hit on the fly into the street was an automatic home run, a feat which no one besides Donny Lynch did with any regularity. No ball playing signs notwithstanding, the drive was a great ball field and a lot closer than the Park.